Photographer Dale Frink and Captain Cici Sayers were aboard an inflatable whale-watching boat yesterday when they had a closer encounter with a blue whale than they would have preferred. The hair-raising incident, caught on film, offers a lesson on just how incredibly massive these animals really are. 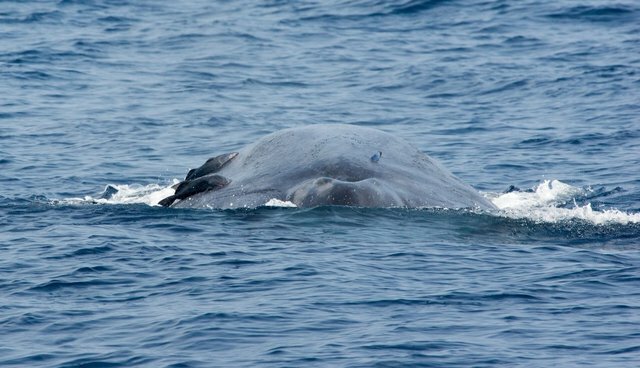 The pair were out observing dolphins and whales 12 miles off the coast of San Diego when they spotted a group of blue whales and moved in for a better look. After stopping at what seemed like a safe enough distance, they watched as one of the whales move in their direction, surfacing periodically to feed. "Suddenly we did not know where the whale was, it could have been anywhere," says Frink, a veteran marine life photographer. "Per proper whale watching etiquette the Captain stopped the boat to wait for the whale to come up before moving away from the animal." That's when, out of nowhere, the whale surfaced close enough to capsize their 23-foot boat, sending Frink and the captain tumbling overboard. Incredibly, the scene was caught on film by a GoPro camera mounted aboard. Watch footage of the encounter here. As frightening as the rare incident looks, neither Frink or Sayers were injured, though the boat was damaged and a cellphone was lost. Another vessel nearby watched the event unfold came and plucked the pair from the water shortly after. Frink called the incident a "freak accident", stressing that the he and the boat captain weren't trying to get too close, and that the massive animal went on its way as if nothing had happened. "I can also assure you that the whales weren't hurt, as they continued to feed nearby for hours afterward (observed from our rescuer's boat, and from Vessel Assist.) It was an accident, the one in a million risk that you take when going into the deep ocean on a small boat," says Frink. Blue whales can reach lengths nearing 100 feet and weigh up to 185 tons, feeding almost entirely on small crustaceans called krill. Such incidents of whales accidently bumping into boats is considered extremely rare.